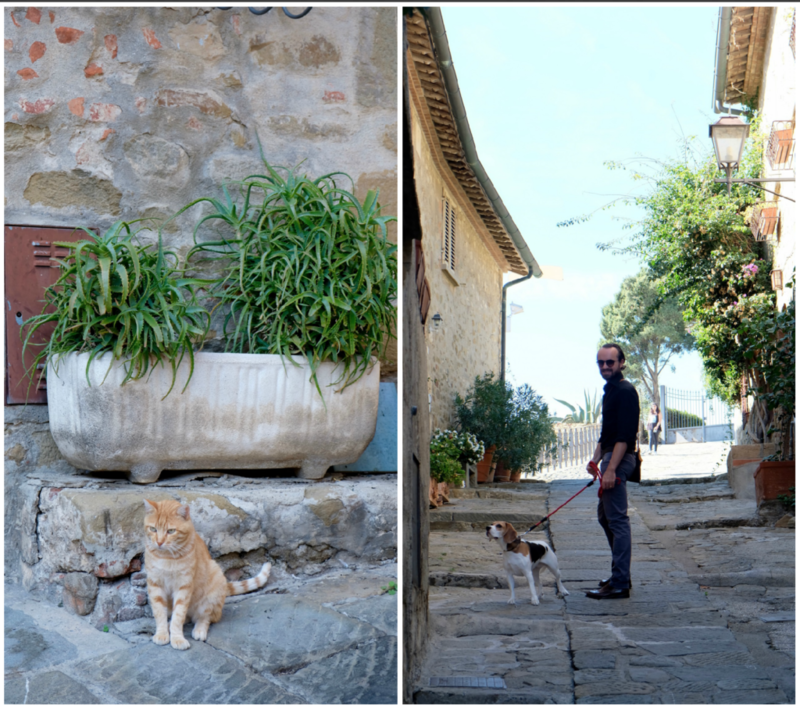 Before I went to a dinner recently at Molo Sedici in Castiglione della Pescaia, I had no idea that Tuscany’s marine life in Maremma was in such dire risk. 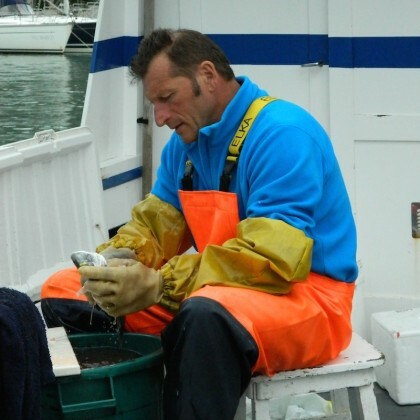 In my inbox came an invite to dinner themed around a talk by Paolo Fanciulli, a passionate fisherman from Maremma who started a wonderful campaign ‘La Casa dei Pesci’ again the illegal act of trawling the seafloor with heavy nets, devastating the benthic flora and fauna that exists down below. Especially the seagrass meadows which works at a natural barrier against erosion and is home to a unique ecosystem which teem with a myriad of young fish. As a fisherman who grew up in the area, this is something that is glaringly close to Paolo’s heart, resulting in a thirty year battle he has personally undertaken to save Tuscany’s coastline and its unique biodiversity. He has worked with organizations such as Greenpeace to combat fisherman from illegally harming the coastline, but the practice continued. Being the creative sort, he had the brilliant idea to first block those doing the illegal trawling by installing cement blocks to rupture the nets since 2013. 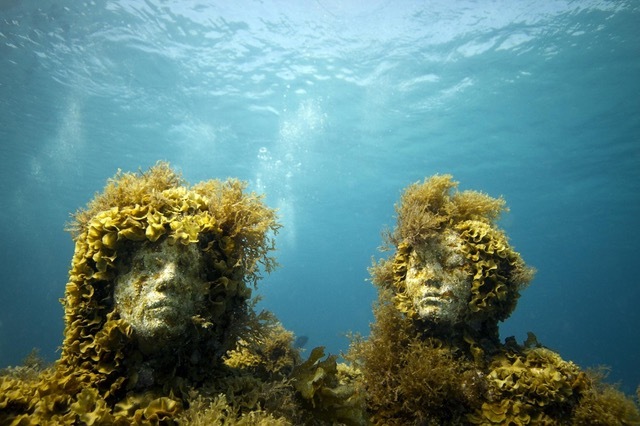 The brilliant idea was then born to replace the cement with statues from marble blocks donated by Presidente delle Cave Michelangelo di Carrara, Franco Barattini, carved by artists such as Massimo Catalani and Giorgio Butini that would in turn create an incredible underwater art museum and stop the nets. Artists from all over the world have participated in this project after hearing about Paolo’s cause—24 have already been completed and they now lie in their “new home” on the seabed (see below). The goal is to add another 20 more by Spring of 2018 with the help of crowdfunding. In the future, the aim is more ambitious: to create a real submarine sculpture museum underwater along the Maremma coast with a ground floor above that can showcase the underwater art in all of its glory. 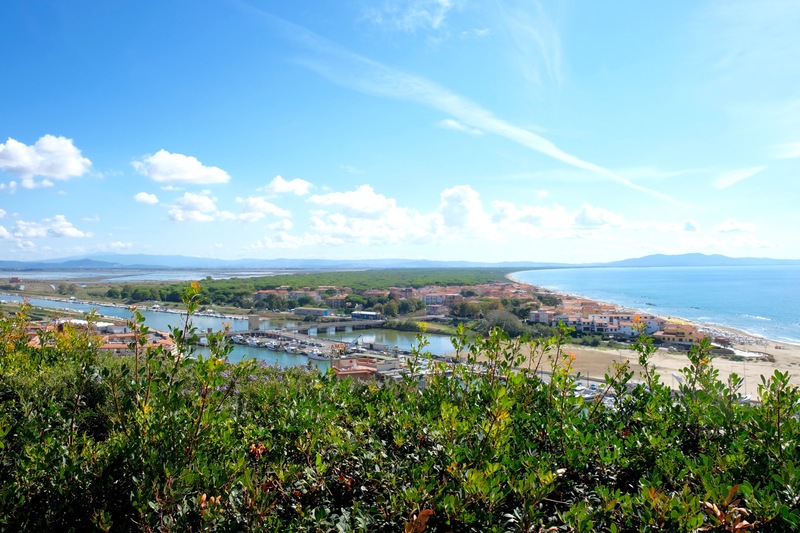 Paolo is also an experienced fisherman who offers eco-fishing tours on his boat Sirena in the Maremma Regional Park. 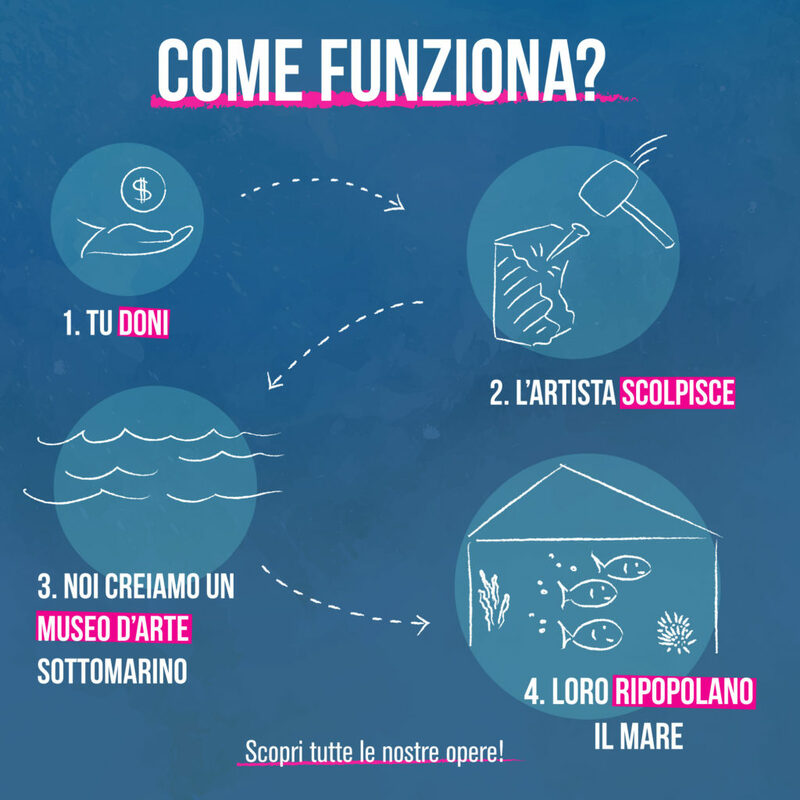 This practice he calls “pescaturismo” (fish tourism) which aims to combine profitability while also teaching eco-sustainability and a greater appreciation for the Italian coastline. 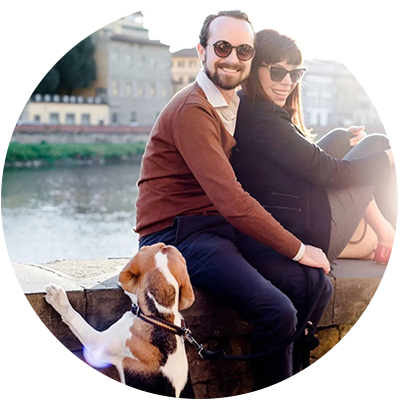 This is something to consider for heading to Tuscany’s coastline for vacation in 2018. You might be thinking, how can a fisherman also be an environment activist? To me, it makes perfect sense. By educating people in what it means to be a eco-friendly sustainable fisherman, Paolo is helping ensure that there will be more fish in the future to catch. It’s not about thinking “what can I get today” but rather what can ensure this livelihood has a viable future in an area vulnerable to marine destruction. 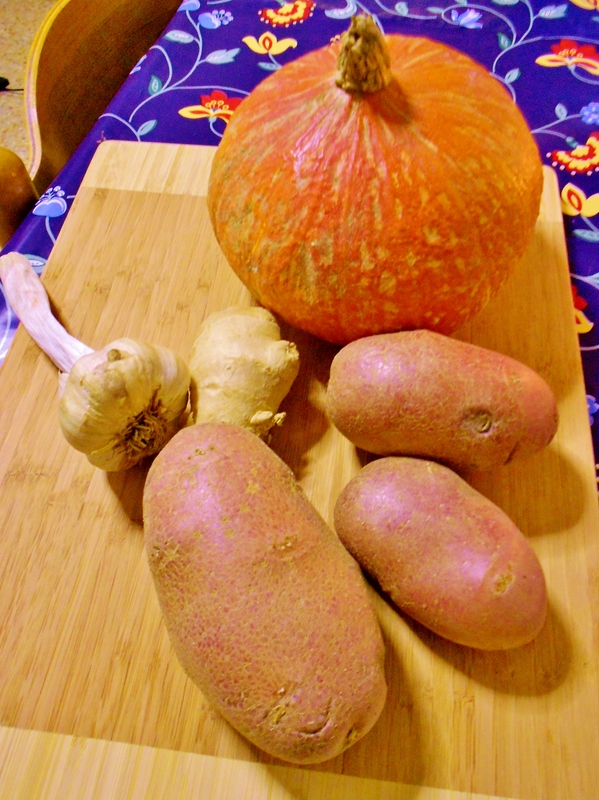 Dinners like the one we attended at Molo Sedici in Castiglione della Pescaia are intended to help fund the project and we were thrilled to attend and learn more about this. A part of the proceeds from the dinner went to the foundation to position other blocks and help extend the already- protected area. In fact it served as the perfect protagonist as they served only the freshest fish and organic vegetables in exquisite surroundings. The decor and vibe at Molo Sedici is elegant, candles flickering with floor-to-ceiling glass windows next to the Mediterranean sea. 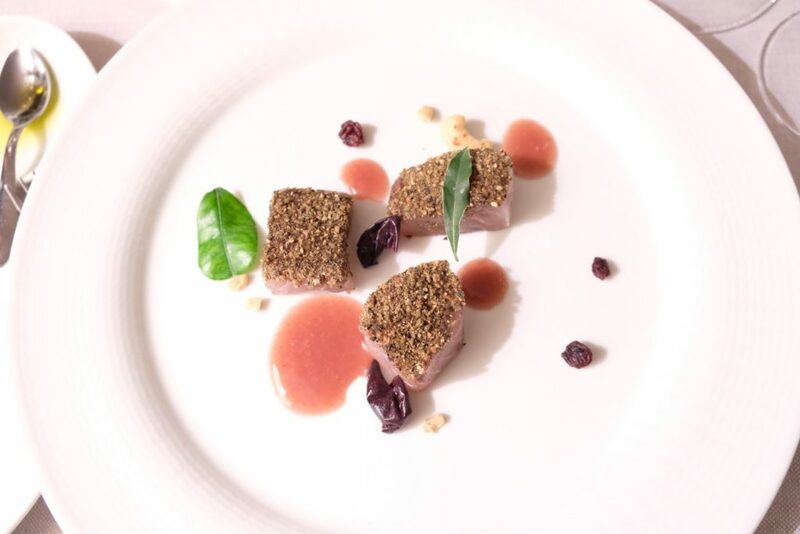 We enjoyed a four course menu with fish caught on Paolo’s boat Sirena, lovingly curated by executive chef Andrea Sgrò. During the event, we were also privvy to an informative documentary on Paolo Fanciulli and his noble battle. Here’s where you donate (via paypal or bank transfer). You can discover more about this project on their Facebook page or here. 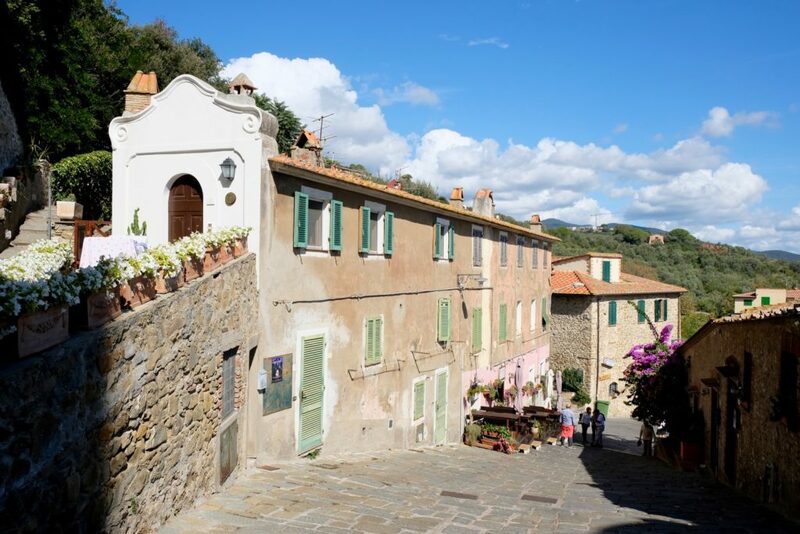 This seaside resort town and fishing village is well known among Italians who like to spend spend long, lovely summers in the Maremma area of Tuscany. Besides the large swaths of notably clean and sandy beaches, from the town’s highest points you can spot Elba and Giglio island on a clear day. 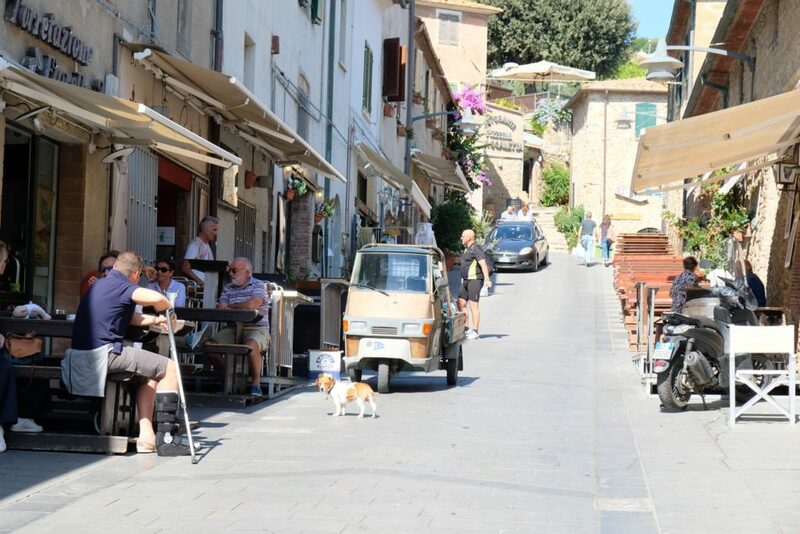 The medieval town center, which is located above the lower town, is beyond charming with locals gathering for catch-ups and coffee. I relished the chance to enjoy a walk through observing fisherman untangling their nets one sunny Saturday morning. My advice is to climb up to the fortress for a look over the sea where you will be richly rewarded with one of the best views in town (see cover photo). Saturdays are market mornings near the pier where most of the action takes place between coffee and croissants at a number of bars in the old town center. The market sells the usual mish-mash of interesting things you don’t really need but might one day “onesies,” underwear, pots and pans and of course fruit and veg. You won’t find anything remarkable but it was still fun to walk through before heading to the fortress to earn that second croissant and cappuccino of the morning. 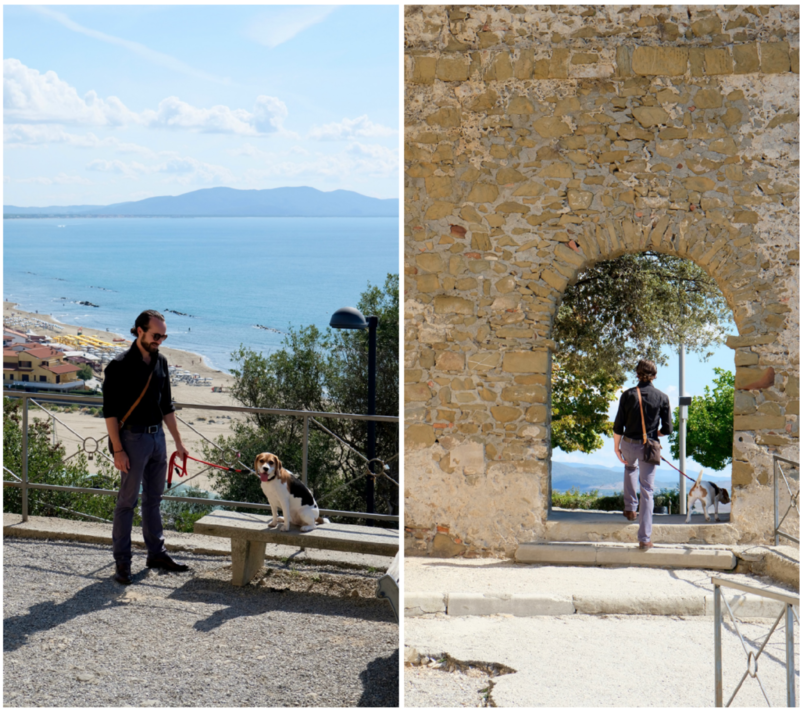 You can read more about Castiglione della Pescaia in this helpful post by Katja of Mapitout Tuscany. 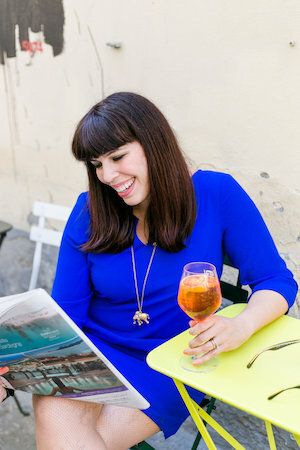 This post is my “water” contribution to this month’s Italy blogger roundtable topic on “Earth, Wind, Fire, & Water” essentially on the elements. 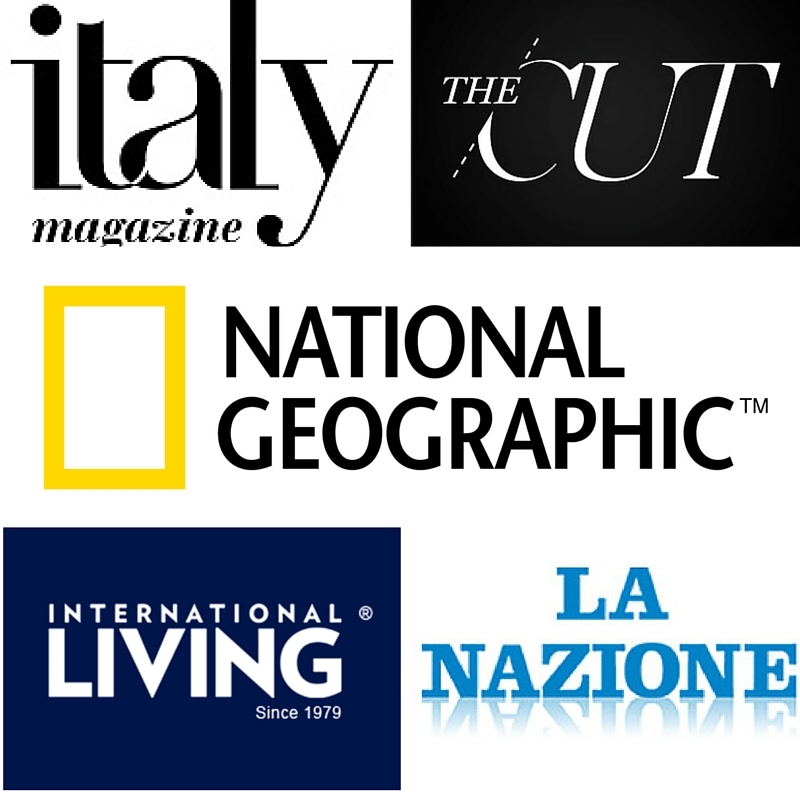 Please check out the posts of my fellow cohorts as they discuss a range of topics from all over Italy. Happy Reading! Great article! Thank you for the passionate yet simple way you explained this great project. Let’s donate, because it of course means to donate a better sea and life to ouselves! Thank you Jessica for the invite and introducing me to Paolo and this project. What he is doing is incredible and I am all for supporting projects like this to keep our coastlines clean :). I love this! Sustainability is absolutely all about 10,20 and 100 years from now not just today. And those who look forward to generations of their family perhaps following in their footsteps and running family business may be able to look at this more deeply and personally than others thanks to he meaning it has. That said, sadly many people who face even the highest stakes at keeping their family business alive (even when it’s intrinsically linked to the health of the earth or the soil/ecosystem) don’t give two thoughts to the issue. 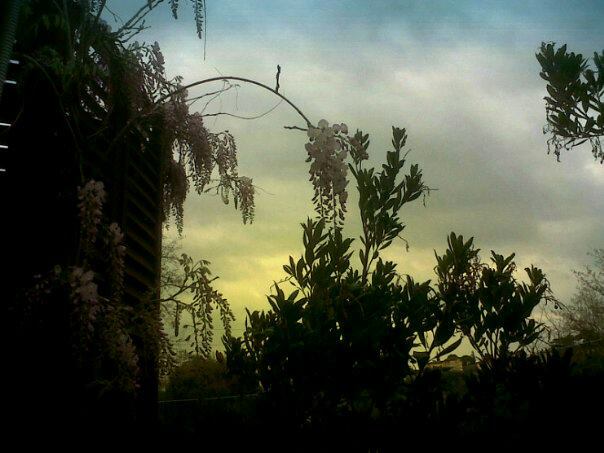 Kudos to Paolo for figuring out ways to draw attention and support by creating this project! Thanks for helping to spread the word about this important topic. Paolo’s long-term vision, focusing on a viable future instead of short-term profit, makes me reflect on the fact that short-term thinking and caring only about the immediate profit is one of the fundamental reasons that the planet is in this environmental mess. What a fantastic idea! Thank you for spreading the word about sustainable fishing and how creativity can overcome all! what a brilliant and creative way of taking this problem on, very impressed.